Got a question that’s not covered? Send it to us here. Where can I get a Morkie? You can adopt, rescue or buy a Morkie. Although it’s ok to LOOK online for a Morkie, you don’t want to actually BUY one until you’ve visited the seller, seen the facilities and assured yourself that you’re not dealing with a puppy mill. Besides profiting from the misery of mill dogs, online sellers are also renowned scam artists. Same goes for ads in Kijijji and other free community “papers” – be sure to visit! Check out these all-too-common swindles: 5 scams to avoid when buying a dog. To find an adoptable Morkie, check out these two sites: Petango and Petfinder. They operate right across North America, automatically collecting information from every pound, shelter and rescue group — in real time — to let people know what dogs are available, where. If you’re dealing with a local breeder, here are the things you should look for: your local Morkie mom. Finally, another route to go is to check with Yorkshire Terrier and Maltese breed clubs and websites. They sometimes have mixed breed puppies available. How much do Morkies cost? It’s crazy but a “designer dog” like a Morkie can actually cost more than either of the purebred parents, the Yorkshire Terrier or the Maltese. Morkies can run anywhere from $600 to $2,000 or even more. Don’t expect to get any registration papers – Morkies are not recognized as a breed (yet) so cannot be registered with any legitimate kennel club. 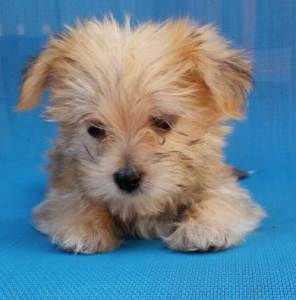 As a general rule of thumb, take your Morkie’s weight at 6 weeks and multiply by 4 for his adult weight. Unlike large dogs, which mature much later, Morkies and other toy dogs reach their full-grown size by about 10 months. Are Morkies good with children? Morkies are OK with children 12+. Any younger kids, and lots of supervision is needed, because Morkies are much smaller than they might seem, based on how active they are. Their bones are somewhat fragile. It’s easy for a small child to get carried away during play and hurt the dog without meaning to. Technically, no animal is totally hypoallergenic, but Morkies are ideal for people with allergies. That’s because Morkies have a single layer or coat that is hair, much like humans, rather than fur like most dogs. Each hair grows from a follicle, which eventually dies and the hair drops off. 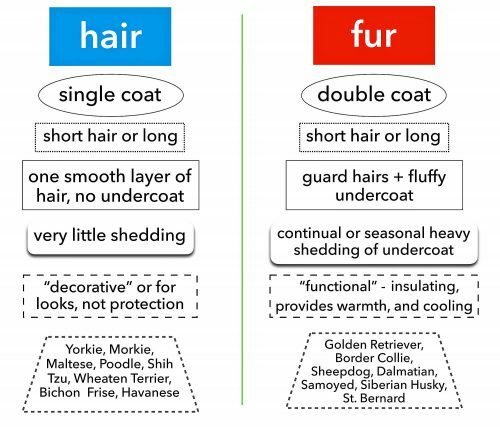 Most breeds have double coats, including the Collie, German Shepherd, Golden Retriever, Lab and most terriers. Double-coated dogs actually have three types of hair – whiskers, guard hair and undercoat. The soft, fluffy undercoat sheds continually, or at certain times of the year, in significant amounts. And that fluff carries dander with it, one of the big culprits for people who have allergies. Even with a long coat, the Yorkie, Maltese and Morkie are all low-allergy pets. Plus, because they are so small, what little they might shed is minimal. What should I feed my Morkie? Dogs need a diet heavy in good quality protein and fats. Quality dog food is lower in carbs like grain, corn and rice. And of course, nutritious food shouldn’t contain artificial preservatives, colouring or mysterious chemicals. A food that has fillers like CORN high on the ingredient list, is not delivering good nutritional value for your Morkie. 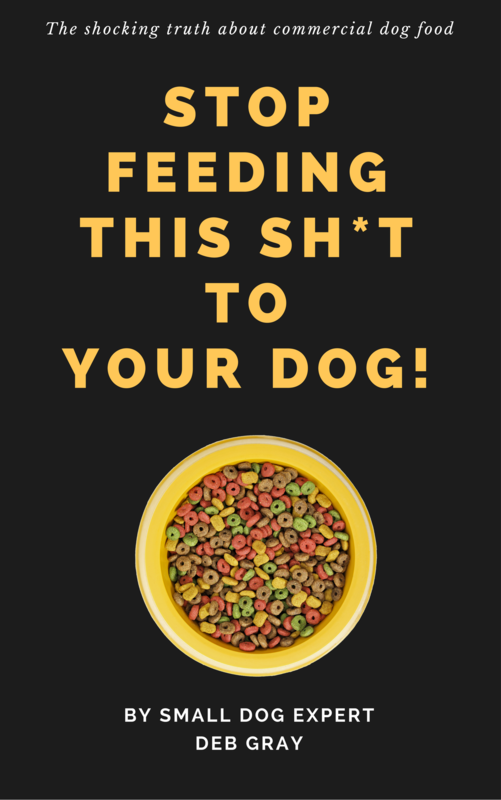 Read more here: Feeding Your Morkie. 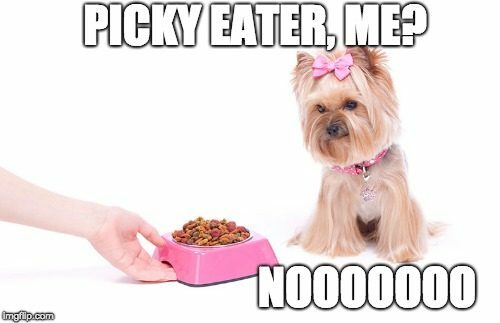 Can my Morkie eat what I eat? In a word, no. Dogs need good quality dog food – whether that’s commercial food, homemade, raw or holistic. Some of our foods can actually make your Morkie sick or even poison him. For a complete list of foods that are poisonous for dogs, check the Humane Society’s site here. What treats can I give my Morkie? You may have noticed a tremendous number of recalls of dog snacks lately – including rawhide chew sticks, flavoured strips and fake bacon products and jerky-based treats. They have been recalled because of worries over salmonella poisoning or harmful, industrial chemicals that have penetrated the treats in error. We give our dogs rawhide because they LOVE it! But, rawhide treats are dangerous, and can even be deadly. What are the dangers with rawhide treats? 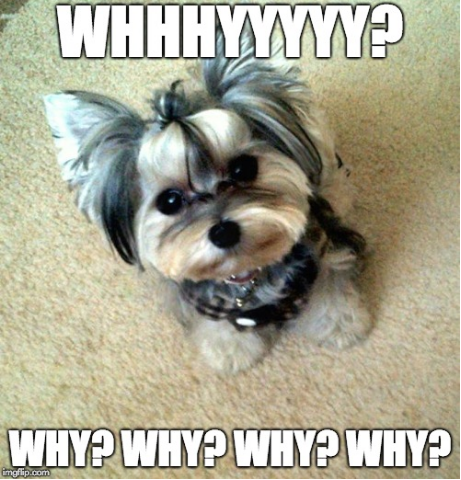 That slippery, slimy piece of rawhide can choke your Morkie if he swallows it, or can even block up his bowel. And for dogs with sensitive digestive systems, rawhide can trigger diarrhea, vomiting, gagging and other upsets. That Salmonella and E. coli can make you very sick too. Rawhide chews for dogs are so toxic and so dangerous, that both the Humane Society of the United States and the ASPCA classify them as very dangerous, in the same category as pesticides and cleaning chemicals. Given the chance of choking, plus the horrible chemicals and poisons that chew sticks are made from, they’re not worth the risk of giving to your Morkie. Quality plastic bones such as Nylabone. Just be vigilant with Nylabones if you have a larger dog in the home too. The small bones can be swallowed by larger pets. Plus big dogs can sometimes work pieces of the Nylabone off. If these pieces are eaten by the smaller dog, there can be serious complications. Help! My Morkie won't eat! It’s important to distinguish between serious reasons why your dog won’t eat, and pickiness or behaviour issues. Dental Disease – your Morkie may have broken teeth, cavities, a loose tooth, gingivitis or a sore in his mouth, any of which can take away his appetite. Vaccinations – can leave dogs feeling sick and lethargic. This is a common reaction to the shot, and should pass within the day; but if the symptoms last longer, get back in touch with your Vet to discuss next steps. Anxiety or stress – new people and places can affect your Morkie’s appetite as well. Many dogs have some degree of motion sickness, so a day’s travel in the car can really dampen that desire for food. If you have eliminated any physical causes for your dog to stop eating, or eating far less, then look at behaviour. Have there been changes in your home that might make him nervous – such as a new pet? Have you moved? A change in family structure? If your Morkie doesn’t settle down after any of these major changes, then it’s time to talk to your Vet. If there don’t seem to be ANY valid reasons for pickiness, experts advise us to simply ignore it. 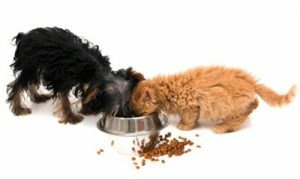 Provide food and fresh water of course, and when your Morkie is hungry, he will eat it. Eventually. To try and stimulate your Morkie to eat more, take him for longer walks. As well, cut back on treats and little extras. Never scold a dog if he won’t eat the food. No matter how upset you are or what the dog did to frustrate you, remember that words carry a heavy weight and dogs have good memories. Positive reinforcement is key. The length of a dog’s life depends on many things and although there are no solid figures, it has been proven that smaller dogs tend to live longer than the large breeds. Plus crossbreeds live longer than purebreds. Yorkies and Maltese live between 12 to 15 years, so it’s reasonable to expect your Morkie can live that long too, with good care and exercise. What shots does my Morkie need? There’s been a backlash against vaccinations – and for good reason! Many people believe we are giving our pets their vaccinations TOO SOON – to puppies that are too young. We are giving TOO MANY TYPES of vaccinations. More is not better! We’re giving them TOO OFTEN. Research shows most vaccinations protect for at least 7 years, if not the dog’s lifetime. So why are we revaccinating and giving booster shots EVERY YEAR? Adverse reactions to vaccines are harming and even killing our pets. …..and SMALL DOGS are often hardest hit. safety – just how safe ARE vaccines? frequency – how often are vaccinations really needed in order to be effective? so many – are all the vaccinations offered necessary? one size fits all – no matter what size the dog, each is given the same size dose! there’s always a risk with any vaccination. Are we managing that risk as well as we could? What’s the downside in vaccinating more, and more often? 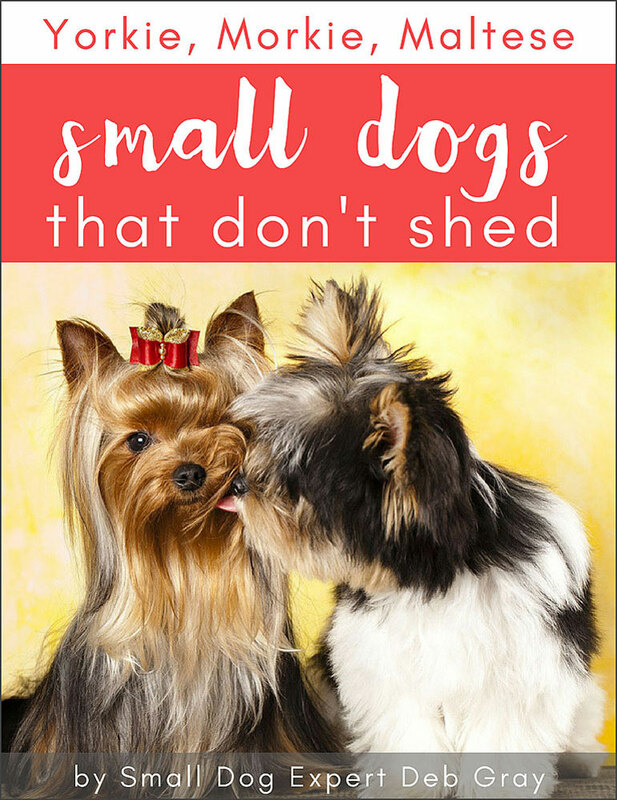 The problem is, there are so many negatives to this approach for small dogs. And there’s very little evidence that more IS better in protecting your Morkie. Puppies need vital vaccinations like distemper, rabies, parvovirus and canine hepatitis. These are the CORE VACCINATIONS. Annual booster shots of core or non-core, when your dog is well into his adulthood, are not necessary according to many respected experts. Be sure to UNBUNDLE shots. 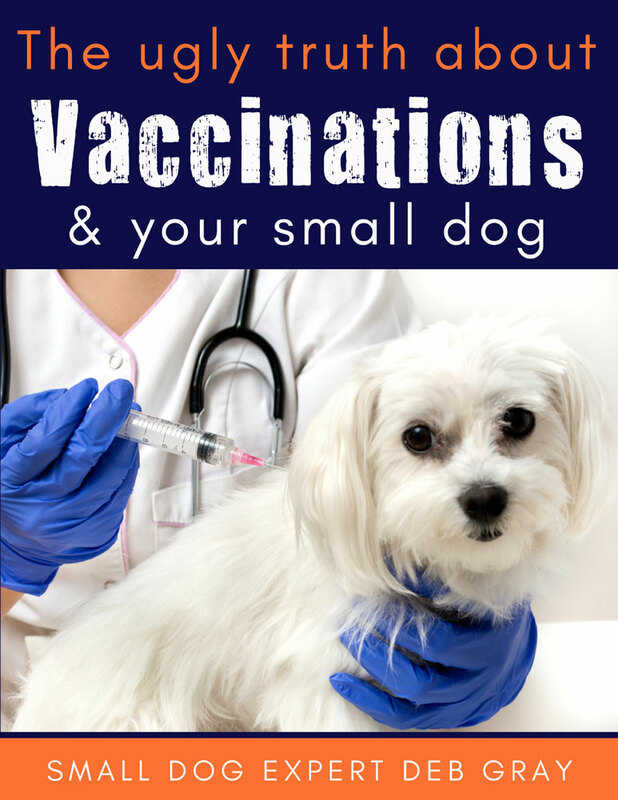 The more vaccines in a single shot, the greater the risk of an adverse reaction, especially for small dogs. Three vaccines at one time increase his risk by 1.5 times. SEVEN vaccines at once, not uncommon, can increase the risk by TEN TIMES! Report any reaction your dog has, to your Vet immediately. Get the lot number of the vaccine used, brand name, date given and location of the shot on the dog’s body and report the reaction and diagnosis to the vaccine manufacturer as well. My dog has diarrhea. What do I feed him now? Pumpkin is like a miracle food because it’s also an excellent remedy for constipation. If your Morkie’s diarrhea lasts for more than 36 hours, or has bloody discharge in it, see your Vet at once. My dog is coughing a lot. What's kennel cough? If your Morkie is hacking and coughing he may have kennel cough or canine infectious tracheobronchitis. Most cases are not serious; it is like a cold for us. Kennel cough generally clears up on its own without treatment. Kennel cough is highly contagious, so keep your dog away from other animals. If the cough hangs on for more than a week, see your Vet who may prescribe antibiotics to target the bacteria, along with cough medicine. Recovery takes anywhere from 3 to 6 weeks. Sometimes a vaccination against Bordatella (the other name for kennel cough) is recommended by your Vet, or required if you are going to board your Morkie. However this is a non-core vaccination (or nasal spray treatment), and doesn’t work particularly well. It’s another vaccine you can reconsider if you want to move away from over-vaccination. Kennel cough is not canine flu – you can read about canine flu here. Oh yes… a dog is sure to get fleas at some point in his life. An advantage of grooming your dog yourself, is that you can spot these parasites early and getting rid of them will be much easier. 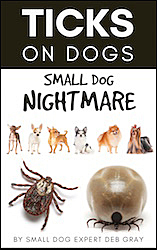 Avoid commercial treatments that fight ticks and fleas: they are poisonous! Take some of these black specks (they look like grains of pepper) and add a couple of drops of water and then wipe on a piece of white paper. If the result is a rusty red colour – that’s your dog’s blood, reconstituted by the water, in the flea dirt. It confirms he has fleas. Tick and flea products are highly toxic, especially for small dogs. That’s because they are strong insecticides, meant to kill determined parasites. FLEA COLLARS are the worst of the worst – they are so toxic that they can overwhelm a small dog’s system and make him very ill, which is why the EPA* recommends we do not use them, or spot-on treatments. To fight fleas more naturally, try a CERTIFIED ORGANIC shampoo like Mad About Organics All Natural Dog Puppy Flea & Tick Anti-Itch Shampoo Concentrate (available at Amazon.com). Or apply a little Lavender Essential Oil to the back of your Morkie’s neck. It will work its way through his coat as he moves and shakes himself, killing fleas and their eggs. The #1 thing you can do to fight fleas in your home is to vacuum at least once a day if you suspect fleas. Empty the bag and take it outside to the garbage. (Here’s where a flea collar can come in handy – leave one in the vacuum bag). It’s available on Amazon and you can read it with the Kindle app, on any device. Read more here. Can I give my Morkie Tylenol? No. Both classes or types of pain-relieving medications –the Acetaminophens and the NSAIDs –are very, very dangerous for dogs. Tylenol is part of the Acetaminophen family of drugs, used for pain relief and to reduce fever. The other class of drugs are called NSAIDs – Nonsteroidal anti-inflammatory drugs. The “Tylenol family” of pain relievers are dangerous for dogs, and should only be given when prescribed by a Veterinarian. There are specific formulations for dogs – drugs such as meloxicam. A toxic level of either type of painkiller can be fatal to a small dog like Morkies. In fact, the number one cause of serious dog poisoning was human medications, according to one pet insurance company survey (nearly 4,000 claims last year). Although it’s tempting to do anything you can to relieve your Morkie’s pain, don’t do it. See your Vet instead. Are Morkies easy to potty train? All toy dogs can be challening to potty train, and experts are divided as to why. Some think it’s because we tend to overlook their little accidents. Others say we’ve short-circuited their natural response to ask to go out, by carrying them everywhere. Whatever the reason, it’s a challenge and can take real patience. But it CAN be done. Start with this one rule: Pick ONE PLACE where you want your Morkie to go. Not inside on papers some days and outdoors other days. One place only, or else he will be very confused. Indoor paper training isn’t the ‘starter’ way to housetrain. It’s an end in itself. do you want her to go on papers, puppy pads or in a litter pan – or go outdoors? use the same phrase every time, whether it’s “go potty,” “do your business” or whatever you choose – many dogs can be trained to go on command, just by using this simple phrase in an encouraging, musical tone. just a firm, “no no no” will do. 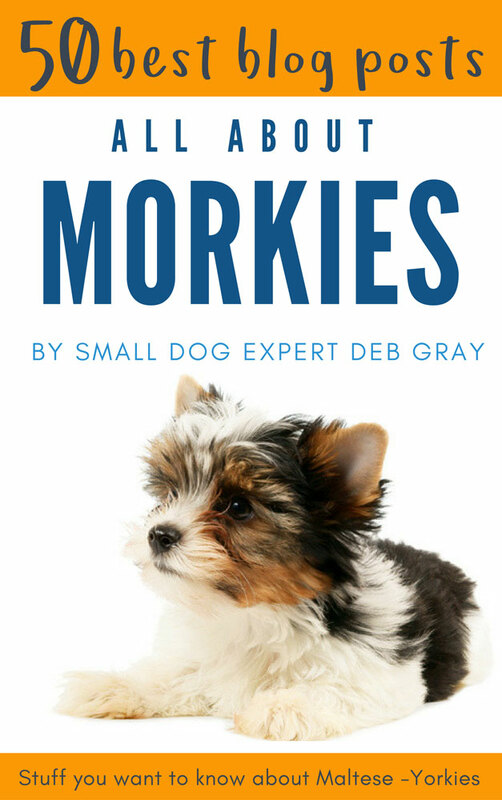 What is the Morkie's personality like? Like Maltese and Yorkshire Terriers, Morkies are affectionate, loyal and devoted. Thanks to the Yorkie’s brainpower, they can be trained to perform tricks and basic obedience. Morkies tend to have lots of energy, and remain puppy-like throughout their lives. Because they can be willful like their Yorkie founding breed, Morkies need challenges and ‘jobs’ to do – don’t baby them too much or they can develop separation anxiety. If they’re over-spoiled, they’ll soon be labelled Morkie with Small Dog Syndrome. Morkies do well with other dogs and non-canine pets they have been raised with. They bond closely to their family, and so suffer if ignored or left alone for long periods of time. Boredom and loneliness will lead to destructive behavior and incessant barking. The Morkie may be a little stubborn and difficult to housebreak. Morkies will not respond to harsh or heavy-handed methods. Training must be done with firmness, fairness, patience, and consistency. Being such small dogs, Morkies don’t need a lot of exercise, although all dogs are better behaved and more healthy if they have at least one good walk a day. Keep your Morkie close on a good leash and collar or harness, beware – their small size can attract larger, less-than-friendly dogs and the Morkie doesn’t back down – his Yorkie heritage coming through! Do Morkies bark a lot? They can. But it can be managed. And while barking is natural — it’s an important way for dogs to communicate — sometimes problems can develop. Why is your Morkie barking too much? As the old expression goes, “it’s bred in the bone” for Yorkshire Terriers to bark. So the Yorkie part of your Morkie, will bark in many different circumstances. Although Yorkies are classified in the Toy Group they really are terriers through and through, and terriers bark. As a working dog, terriers were developed over many generations to bark as part of their function. Yorkshire Terriers were developed to chase and kill rats and vermin in factories, so their bark was a big benefit. In fact, at one website, Yorkies are included among the “top 10 dogs for watchdog barking,” along with Rottweilers, German Shepherds and Airedale Terriers! Maltese, on the other hand, are not terriers, and so don’t have the same strong, built-in desire to bark. However, they were bred as lapdogs and one of their functions was to warn their owner when someone was coming or going. Maltese will bark when someone comes to the door. The good news? You can address excessive barking (with a lot of patience and over time). Even if a dog is bred to bark, you can modify how much through training and lifestyle. The principle is pretty simple: reward good behaviour (“stop barking!”) and ignore the bad (time out for dogs that won’t stop barking or just ignore them – Morkies HATE that!) Don’t punish barking – YOU shouting simply escalates the barking. Desensitization to the trigger, along with more socialization with people and other dogs, will go a long way to reduce this type of barking. Ignore the barking, or time out! Professional dog trainers advise you to “actively ignore” barking by avoiding eye contact and not speaking to your dog. This conveys the message that you’re not impressed with the barking and that you’ll respond when it stops. Time for a timeout, another room, away from your attention. Again, no eye contact and don’t say a word. What is your Morkie telling you? The territorial bark: distract your Morkie as soon as he starts barking. Catch his attention with a treat or by playing. Every time the bark cycle is broken, it sends the message that “quiet” will get the most reward. Nervous barking usually results when your Morkie is nervous, lonely or suffering from separation anxiety. Make sure your Morkie gets as much of your undivided attention as possible when you are together. If you’re out all day, is it possible for someone to come by mid-day and take the dog out for a walk? Or, try leaving the radio on. Bored or lonely barking can be controlled with lots of exercise; being walked on a leash reinforces the natural order of you as the pack leader, and helps settle and calm the dog. It’s a great way to burn off your dog’s excessive energy, while you burn a few calories at the same time. Fear barking – if your dog has been traumatized or hasn’t had enough socialization, you may experience ‘fear barking’ or acting out. This is a more difficult problem to address but it can be managed. Do Morkies get along with other dogs? With cats? 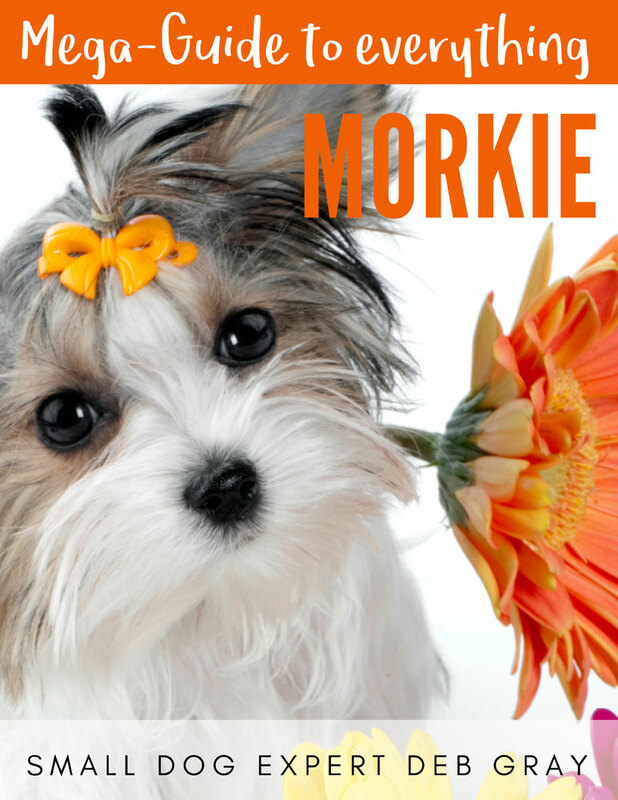 Yes, Morkies are good natured and easy-going pets. The Maltese side of the equation has calmed them down a little from the more aggressive Yorkie. more dogs get lost on the 4th of July than any other single day in the year. besides inducing massive fear, loud sounds can also damage a dog’s more sensitive hearing. dogs have personal space too and a hand coming into their face area invades it. to dogs, hugging is an unwelcome sign of dominance. a dog’s sense of smell is 10 to 100 THOUSAND times greater than ours, so let him sniff. prolonged eye contact is something that makes dogs really uncomfortable. In the canine world, it’s a sign of establishing dominance and a challenge to fight. dogs are pack animals and they need their peeps around them to feel comfortable. Otherwise they can get depressed and anxious… which can lead to Canine Anxiety Disorder. 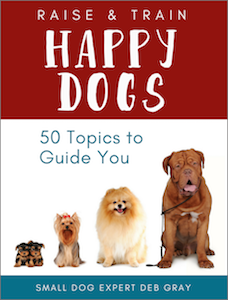 you can’t put on a fake happy face for your best friend, but dogs are upset and unnerved if you’re upset or depressed. Dogs live for routine and steady environments. when you yell at a dog, it sounds like angry barking and that signals trouble. Your dog won’t understand a thing – except that dangers’s at hand. dogs dream and don’t like a dream distured. Don’t wake them up unless you really must. It’s startling and unnerving. dogs can sense vibrations and hear sounds that we miss, and vacuum cleaners have plenty of both. Invite your dog into another room when it’s time to hoover. How often should I bathe my Morkie? Once a month or once every six weeks, is often enough to bathe your Morkie. Otherwise, you risk stripping the natural oils from his hair, which will be dry and flyaway, even breaking off. And his skin will be dry and irritated. To keep your Morkie clean in between baths, try combing and brushing. 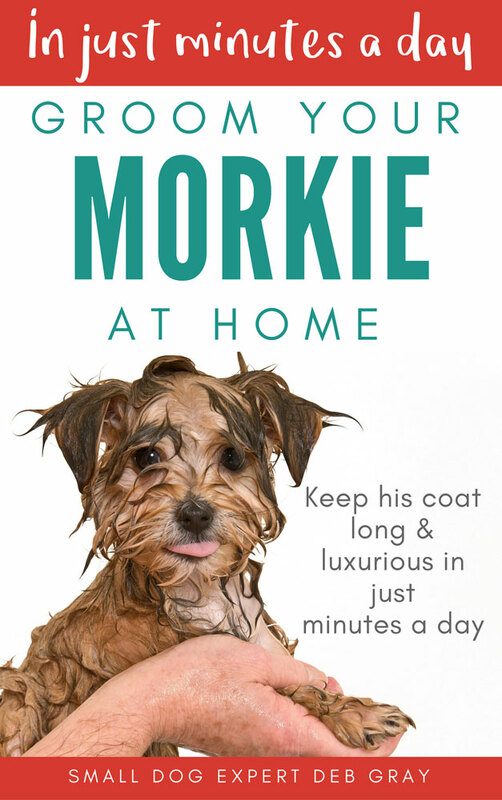 That seems to take out dirt and debris from the coat, and your Morkie will look (and smell) great. No. Both Maltese and and Yorkshire Terriers have hair not fur, so the Morkie has hair too. How can I get rid of the stains under my dog's eyes? Those stains are caused by excess tears, which keeps the hair under your Morkie’s eyes wet. This causes the hair to “rot” and even smell bad. 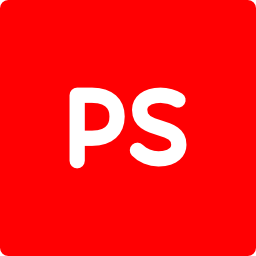 It also causes a colour change – to a darkish brown colour. It’s often called “Poodle Eye” since light poodles get it so often. The first task is to figure out WHY your Morkie has excessive tearing. Then, clean up the stains with a natural product, and third, keep the under-eye area dry. This is a very popular commercial product used to treat Poodle Eye. Many dog owners swear by it. The only problem is, that it contains Tylosin, which is an antibiotic used in the farming industry (it has not been approved for dogs or cats by the FDA). Personally, I don’t think it’s a good idea to put your dog on a lifetime supply of antibiotics, especially for something that is essential cosmetic. I wrote 3 blog posts with extensive information about this common problem in light coloured dogs. If you have a question, send it along by clicking here. The author of this blog is not a trained dog health professional. It is the reader’s responsibility to consult with a licensed, practicing Doctor of Veterinarian Medicine (DVM) (or equivalent in your country) before making any changes to your method of feeding, grooming or any other matter of dog care for any dogs for which you have any responsibility or contribute, in any way, to his or her care. This information is for educational purposes only and is not intended to replace the advice of your own Veterinarian. 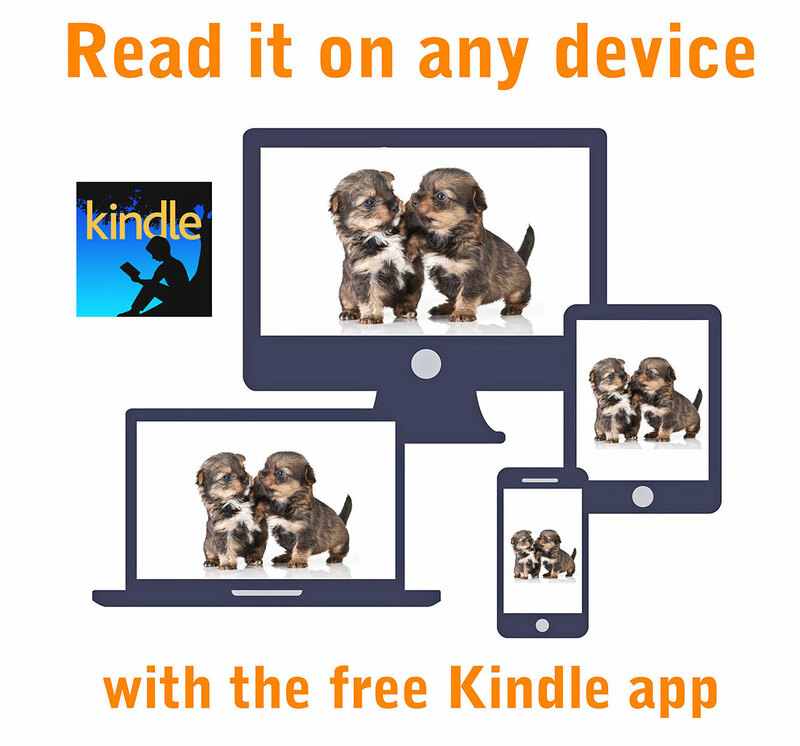 Download and read on any device. Learn more.